"Nature's Nutrient for Neurons" is a great catchphrase, but doesn't do this medicinal marvel justice. A great tonic for the mind, for the stimulation of nerve regrowth and for gastrointestinal disorders; it is also a great tonic for the lungs. This gourmet mushroom has been referred to as 'Nature's Nutrient for the Neurons' on account of its ability to stimulate the production of nerve growth factor (NGF). NGF plays an essential role in the differentiation and survival of several nerve cell populations in the central and peripheral nervous system and lower than normal levels of NGF have been shown to be linked to early stages of both alzheimers disease and dementia. NGF is also known to have insulinotropic, angiogenic, and antioxidant properties and reduced plasma levels of NGF (i.e. when there is less NGF present in blood plasma) have been associated with cardiovascular diseases and metabolic syndromes, including type 2 diabetes. NGF also accelerates wound healing and there is also evidence that it could be useful in the treatment of skin and corneal ulcers. Animal studies have shown NGF to have a profound effect on airway inflammation, bronchial and asthma-related symptoms with increased NGF levels observed in bronchoalveolar lavage fluid and serum from patients with asthma. In China the mycelial extract is used to make Hericium Erinaceus Pills to treat gastric and duodenal ulcers, chronic gastritis, gastric and oesophageal cancer. Here is a list of benefits of Hericium Erinaceus which either have been proven, or are currently being researched. Dementia. In controlled studies Hericium Erinaceus supplementation showed beneficial effects in patients with mild dementia. In one study 6 out of 7 patients showed improvement in functional capacity (understanding, communication, memory etc.) while all 7 showed improved Functional Independence Scores (eating, dressing, walking etc.). However, four weeks after the conclusion of the trial, when the test subjects ceased using the extract, cognitive function scores decreased. 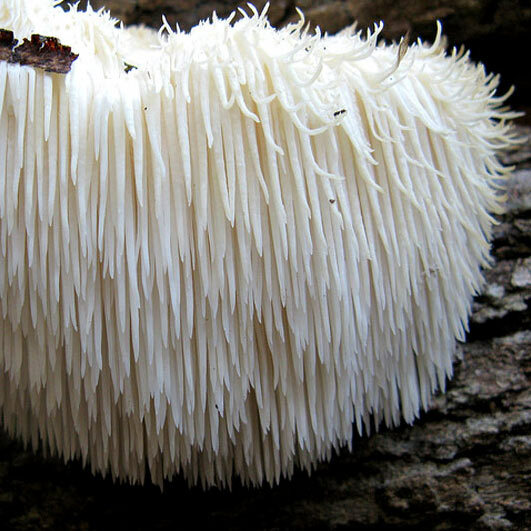 MS. Hericium Erinaceus fruiting body extract has been shown to improve the myelination process in mature myelinating fibers. It s hoped that further research will prove possible benefits for MS patients. Neuropathy. NGF plays a role in pain sensitivity and low NGF levels have been linked to sensory neuropathy in both in vivo and in vitro studies. Enhanced NGF production has been shown to protect sensory function in diabetic rats. Nerve Damage. Rats given aqueous extract of Hericium Erinaceus fruiting bodies showed faster recovery from nerve injury, suggesting potential for application of H. erinaceus in the early stages of nerve regeneration in humans. MRSA. Extracts of both fruiting body and mycellium exhibit anti-MRSA activity with erinacines identified as active compounds. In clinical tests in Japan MRSA is reported to have disappeared in a percentage of patients whose diet was supplemented with Hericium Erinaceus.erinaceus. Gastritis. The Lions Mane Mushroom is also anti-bacterial, and has been used traditionally to treat a number of different gastritis conditions. We know know that Heliobacter Pylori is a major cause of gastrtis, so the antibacterial action is likely to be the source of benefit.